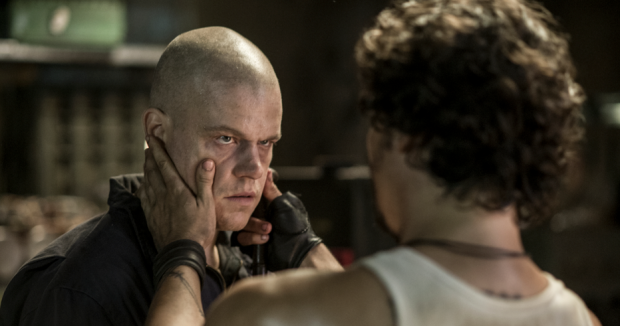 The big budget sci-fi action spectacle Elysium, written and directed by Neill Blomkamp and starring Matt Damon, serves as a master class in how to make stupid look smart. Successfully walking the tightrope of a plot that would snap in half if you spent more than 30 seconds thinking about it, Blomkamp builds a beautifully-rendered world divided between the rich and the poor. Much like his explosive feature debut District 9, the filmmaker opens this film with guns blazing, establishing all of our central characters and their surprisingly clear motivations. Unlike District 9, the further Elysium‘s ambition stretches (commentary on immigration, new tech, the rights of big business, etc. ), the sillier the film gets. Where District 9 remains a fun piece of entertainment with a simple, yet powerful, position on intolerance, Elysium reaches for something more and comes up with a bit less. Max De Costa (Damon) is our reluctant hero, an ex-criminal stuck on Earth working a dead-end job at a robotics factory. He’s got a childhood love named Frey (Alice Braga) who’s just come back into town. She’s true and good and has a young daughter with Leukemia. See, on Earth in the year 2154, real medical care is a near impossibility. While the poor live on Earth, the rich live on Elysium, a high-tech space station that is damn near close to Utopia. 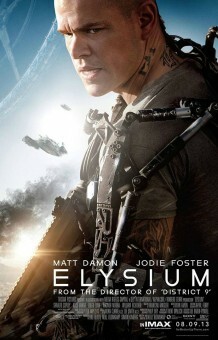 On Elysium, no one is sick and nobody dies. Med-Bays cure any and all citizens of the space station of any and all sicknesses within seconds. Following a lethal radiation exposure at the factory, Max is told he has five days to live. In flashbacks, we are told that Max has always dreamed of living on Elysium. Now, he needs to get there. And just like that, he’s forced back into a life of crime, taking a job from Los Angeles’ underground king Spider (Wagner Maura). Meanwhile, Elysium’s Security of Defense Delacourt (a hammy Jodie Foster) has some mustache-twisting evil plans involving a government takeover via corporate collusion with a particularly prickly CEO named John Carlyle (William Fichtner). Delacourt’s disgraced agent-on-Earth is named Kruger, and he’s played with gleeful menace by Sharlto Copley, the sole human highlight and thankful comic relief of this overly-serious picture. Following an aggravatingly underwritten scene between Delacourt and Carlyle, the tale of Max and the tale of Elysium begin to collide, resulting in both remarkable entertainment and remarkable absurdity. As the narrative moves forward at a refreshingly brisk pace, shortcuts are taken that sacrifice some of the rules established in the first act to allow for some deus ex machina and keep our hero alive . Damon is reliable as Max, of course, but left with little to do. Despite its intriguing premise and sometimes-provocative political suggestions, the production design and special effects are the real attention-getters here. It seems that Blomkamp does not have quite enough room for his big ideas and his big spectacle. What we are left with is a compromise between brain and brawn, resulting in something good that could have been quite great. Elysium opens on Friday, August 9th.